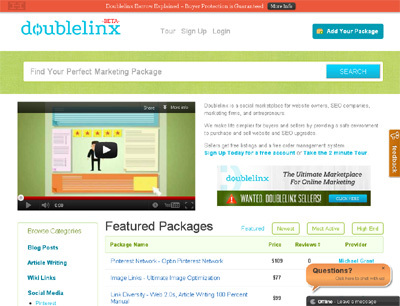 Doublelinx provides a safe environment to buy and/or sell online marketing services. Doublelinx also provides a top notch order management system for online marketing providers. Doublelinx uses an escrow account between the buyer and seller. When the seller does a great job, the buyer approves, and we credit the funds into the seller’s account. No monthly fees, but Doublelinx Sellers are manually approved by our Doublelinx staff to ensure quality. If there is an online marketing service that’s awesome – sell here. Currently our competitors are SEO forums where they buy/sell/trade (mostly buy/sell) in an unprotected way. Buyer pays through Paypal for a service, seller takes the money, and delivers the report. No protection there, since PayPal doesn’t give refunds on services. We provide a Doublelinx escrow service where the buyer has to approve the service before the seller is credited. Fiverr is also slight competition, but you get what you pay for. You can’t find a complete WordPress Installations with 100+ custom templates for $5. You also can’t find 20 hours of manual link building for $5. We also may be facing Basecamp, since a lot of sellers use this for project management. They also use Wufoo for Payment Processing. We include both in a free account. Of course, we don’t want anything BlackHat on our site, but there are definitely some great services there.